Having a strong connections between your indoor and outdoor design schemes can make your home feel more expansive, fill your space with light, and can encourage flow between indoor and outdoor rooms. 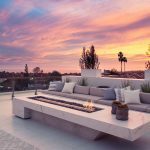 In fact, there are few design changes that have such a great and immediate impact on the way you experience everyday life in your home and backyard. 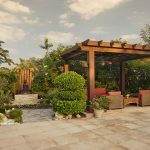 Whether you are planning on remodeli­ng your home or simply want to get inspired, here are a few ideas to start you on the path to bridging the gap between the indoors and out. An ample-size pivoting glass door creates an impressive entry on its own, but when you pair it with a back wall of glass doors, the light flows creating the illusion of endless space. Using the same flooring material indoors and out also creates an uninterrupted flow from the front to the back of your home. You can even get creative, adding an around the corner window. When you get rid of the corner, it makes you feel as if you are part of the view. We guarantee that this spot will become the highlight of your home! Corner windows are not just for grand villas. They also provide an amazing opportunity to bring the outdoors in so you can enjoy the view of your stunning backyard all day long! 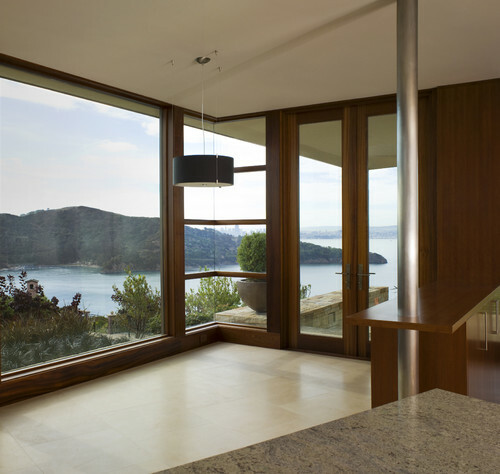 If you have a spectacular view from anywhere in your home, that’s where to put your corner window. Outdoor rooms in the backyard provide a wonderful opportunity to create a secluded space in the calming atmosphere of your backyard or garden area. Having a covered space next to the house, such as a pergola, gazebo or other custom built shade structures allows you to enjoy your backyard from the comforts of your shaded retreat. Be sure to add comfortable seating and don’t be afraid to get creative. Consider adding a fireplace or custom water feature to enhance your landscape aesthetic. Frequently we all bring our work home with us. If you spend time working from a home office your deserve a fabulous open view. Start by positioning your desk in a room with an inspiring view. Make sure the windows face your desk, and if possible they run right up to the ceiling for maximum views and light. This small change will help create a productive space you will enjoy working from. 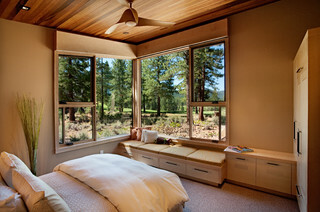 What better way to create a seamless transition than with a constant view of the great outdoors? A walk-out ground-floor family room can be enhanced with pocket doors or sliding glass doors. 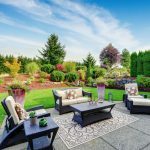 The immediate connection with the outdoors will help lure your family and friends outside to enjoy your backyard retreat. Why not completely lose the wall? Opening up an entire side of your home with floor-to-ceiling glass doors is a dramatic change that could revolutionize your space. Accordion and bi-fold glass doors can be completely pulled away to blend indoors and out. This feature is especially suited to modern homes and mid century ranches warmer climates, but it could work well for other home styles as well. One of the key components to creating a seamless transition from the indoors to the out is to remain true to the design of your home. A wraparound patio that mirrors the shape of your villa, especially when paired with intriguing glass doors and generous windows, makes your indoor and outdoor spaces feel more interconnected. Creating strong connections between your indoor and outdoor design schemes will expand your space with light and will encourage flow between indoor and outdoor rooms. Follow the above tips for a few changes that are sure to elevate your home, your lifestyle, and your daily demeanor!